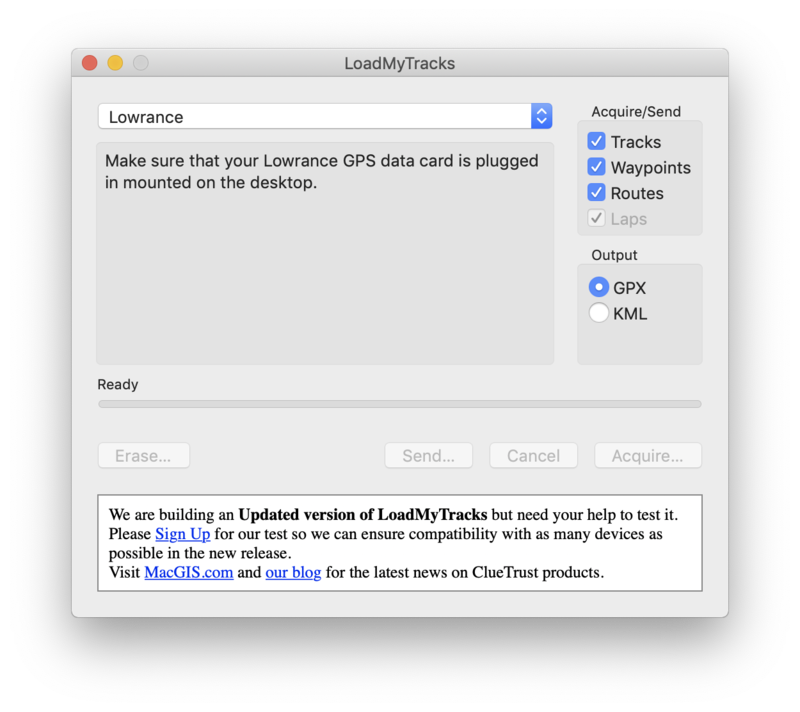 LoadMyTracks is a Mac App that will communicate with GPS devices from many manufacturers to send and receive data. It can also be used to translate data between the popular GPX and KML (Google Earth) formats. The software provides support for Waypoints (single locations in space), Routes (lists of waypoints that can be used as instructions of where to go, Tracks (the breadcrumbs that many GPS devices keep to show where you have been) and additional data that may vary by device. We've been working with the help of many of our users to create a utility that is straightforward and easy to use, while also providing most of the features necessary to satisfy beginners and power users alike. Thanks for all of the encouragement and good thoughts by our current and future users. Please continue to provide us with the great feedback that you have with previous versions. We are in the process of testing a new version of LoadMyTracks and are looking for people to help us test. Please sign up for our mailing list to get links to the beta versions and updates on the new development. ClueTrust, the ClueTrust lightbulb, Cartographica, the Cartographica logo, and CartoMobile are registered trademarks of ClueTrust.